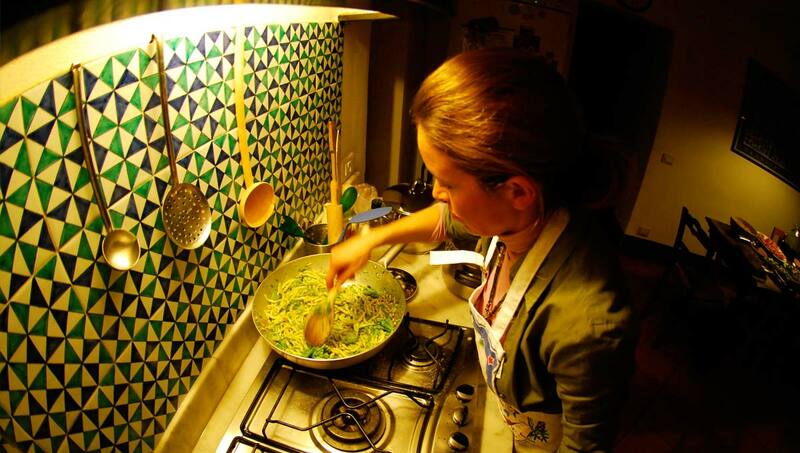 I am Chicca Maione, a Tuscan-based architect and designer, proud mom, former bike globetrotter, and a passionate cook. I was born and raised in Naples in a big family where meals were the highlight of each day, an opportunity for my family to gather around the table, and enjoy in the good food and conversation. Eating was a ritual associated with intense memories: the table cloth we used every day, the plates, and the day of the week in which certain dishes were made. My nanny, Lina, cooked for my family for over 54 years. I used to sit in the kitchen while she cooked, absorbing the smells, gestures, and flavors, collecting recipes in my Hollie & Hobbie notebook. Some years later I earned my degree in Building Design and Sustainable Architecture at Università degli Studi di Napoli Federico II. I was ready to see the world and I spent the next 15 years cycling all over the world, through countries like Zimbabwe, New Zealand, Australia, Iceland, Alaska and Ecuador. 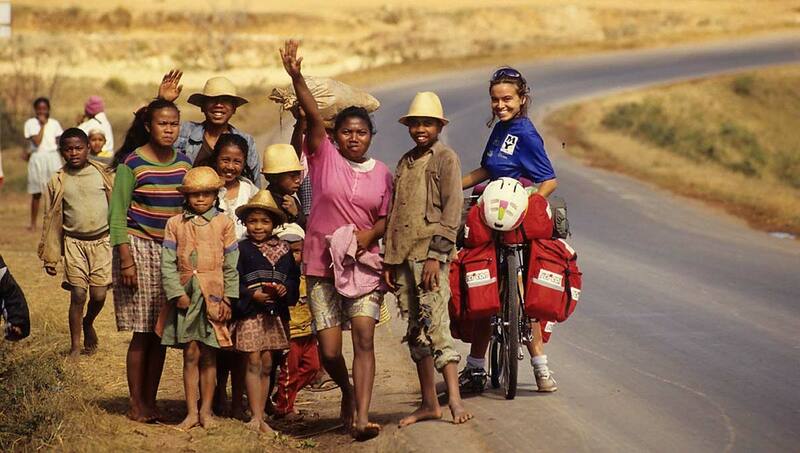 I was a passionate cyclist, and life was wild and free! During this time of my life I collected, dried and pressed flowers from all over the world that I used to make paintings, lamps for a design company and also a foulard for Nina Ricci. After the birth of my daughter, Elsa, my family and I moved to Tuscany where I went to work on restoring my 18th-century farmhouse, La Casa Toscana, where I still live. I restored my home and designed my own kitchen using sustainable, organic materials. I traveled to Carrara to select the marble for my countertops, the same marble that Michelangelo used for his statue the David. I think both are works of art! For Italians cooking is a sacred act. Recipes are passed down from mother to daughter from generation to generation, but most recipes are not written down and have no exact quantities. It’s about absorbing the knowledge, cooking day after day, and combining the best available products, seasonal and local. Living in a world of processed food, we’ve lost control over what and how we eat. We’ve lost connection to the ingredients that nourish us. Home cooking can bridge that gap and help us gain control over what we eat and in return, how we feel. I’m a firm believer in seasonal, organic, and locally produced ingredients; therefore, two staples in my kitchen are my own fresh pressed extra virgin olive oil, pressed from the olives that grow on my property, and fresh-cut herbs from the garden. For me cooking is a creative experience that involves mind and body, smell and touch, mood and imagination. It is an act of love and generosity, because it is something that we also do for others. I opened my cooking school with the idea of sharing what I know about Italian cooking. I founded Cooking in Tuscany, a culinary international organization that operates through my cooking school with the mission to teach authentic, home-cooked food and inspire others to cook for themselves and their families. The aim of the association is to experiment and research old traditional recipes, to use and emphasize seasonal products, and to promote the culture and the tradition of our place through the knowledge of its local products. When you participate in a class you will become a member of Cooking in Tuscany, joining our network of people passionate about food and cooking. We will be in touch through social networks and all the digital media to continue to share recipes, experiences and ideas with people all over the world. I would like to express my deepest gratitude to many people that have helped make this website. My special thanks goes to Arnaud Bachelard, the person I choose to live my life with. His patient guidance, enthusiastic encouragement and useful critiques are very helpful all the time. I need to thank him for all the incredible pictures he provided, for all the times he ran into the kitchen to take a picture of a dish whatever he was doing. Thank you for being so present in every moment of my life! Then I have some special people to thank. I met them through Workaway and they lived in our house for a while. All of them were very special for their advice and assistance. They have been an incredible support group, and I will never forget what they have done for me. Thank you Nate and Jessica, Paul, and Ariana for your contribution to this project. You are always welcome at La Casa Toscana! Special thanks should also be given to Eric Thevenet, for his professional guidance and his useful recommendations on the making of this website.